Sarah and Nick. We leave Manila in July of 2011 for a visit back to the states over the summer.In September we report to Washington, D.C. for Spanish language training before heading to Lima, Peru April 2012. 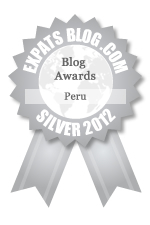 ExpatsBlog.com Expat Blog Awards 2012: Peru Silver Award! This blog won the Silver Award for best expat blog in Peru! Love this blog! Always fun insight into the live and times of a family finding their way around new countries and cultures while holding onto what matters, family and friends from Minnesota all the way to Peru and in between. I recommend this blog for the Gold. As a former FS employee who never had blogs or cell phones or skype this is the best way in the world to keep track on what is going on in the country they are living in. It's fun to read and know it takes her hours to put these things on Facebook. And an excellent way to keep us in touch with our granddaughter. Your Name Do you think this blog has what it takes to be listed at the top of Expats in Peru Blogs?